Lift long enough and you’ll experience every level of DOMS (delayed onset muscle soreness) from light to debilitating. So what is it really and what does it tell us? Novice lifters when they first start training. Delayed onset muscle soreness can occur after almost every training session for quite a few months. Lifters of any experience level who change their training. This creates more mechanical tension or a higher degree of adaptive response. The severity of DOMS and the length at which it hangs around varies from individual to individual. All things being equal (like diet and experience), his may be due to genetics. Some get very sore for long periods of time from even casual exercise, and others can train balls to the wall, even using a new routine or new intensity techniques, and experience little or no soreness. Some muscle groups rarely get sore. 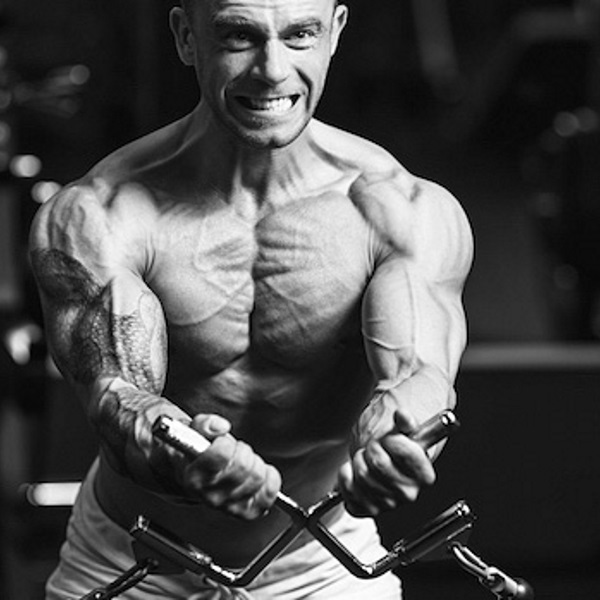 The delts and forearms can take a beating and barely get sore for most people, even on novices. Yet plenty of people still grow Popeye forearms and cannonball delts with little DOMS in those areas. The training-frequency-to-DOMS relationship doesn’t add up. People who train infrequently tend to get DOMS more often, and people who train more frequently usually don’t experience a high degree of DOMS. Yet high frequency training tends to have a strong correlation with more growth. Large strength gains can be made without soreness. This one can be especially true for advanced lifters, especially if they know how to work with sub-maximal loading related to high volume work, and carefully coax the body to move forward neurally by improving the motor cortex in association with movements. As the body becomes efficient at performing a movement with greater ease, heavier weights can be hoisted. Why? Because maximal strength requires neural adaptation, while greater and greater degrees of hypertrophy (muscle gains) can be reached without ever maximizing your strength. They are two very different animals. Newbies usually have DOMS more often, and most consistently. At no time in your training life will muscle growth come faster than in the early stages, especially if you’re consistent with your training. During that time, the lifter tends to be sore from most every training session and every exercise. Once again, the degree of which will vary between people, but I’ve never met a single novice lifter who wasn’t sore quite often. You’re either adapting or you’re detraining. There’s a strong correlation with DOMS and the inclusion of new movements, new intensity techniques, and new workouts. And while it’s true that growth from these tends to show up later when DOMS isn’t as prevalent, that doesn’t rule DOMS out as a barometer for growth. Remember, muscle growth is a slow process. We wouldn’t expect someone who’s sore to see the growth from that soreness while DOMS is taking place. We’d expect to see it weeks or months later when the body has adapted and the repair process at the cellular level has taken place. A. Get sore for a few weeks. B. Stop getting sore, but still see performance or strength increases. C. Stop seeing performance increases and instead hit a plateau. D. Start seeing performance decreases or lose motivation. The timespan from A to D can vary, but it generally falls within a 10-12 week period. This depends on the qualification of the athlete. Well-trained people tend to adapt very quickly to new stimulus, routines, and stress. But novice lifters can often stay on the same routine for months on end and still see muscular and performance increases, all the while still getting DOMS. So all of these things come with caveats. But once you become fully adapted to a stress, detraining is going to be just around the corner. This is when you can’t break past a rep plateau for a lift, or when you see muscular gains come to a halt or performance decreases, i.e. you can’t hit weights you could previously, or hit PRs anymore. Either you’re in a state of adapting to something, and the body is creating a state of preparedness (through strength or muscular gains), or you’re detraining because the body has made the physiological changes needed to handle the stress thrown at it. This has actually happened to me. But in retrospect what I realized was that my “maintenance” training was actually what I needed to allow the recovery process take place from the training I’d been doing. This isn’t a lot different than going into a state of overreaching, then deloading or resting, and allowing supercompensation to take place. If anyone has ever taken a week off, then hit the gym the next week only to find themselves much stronger, this is exactly what happened. Recovery was getting shortchanged. Without enough of it, the body is in a curve of fatigue debt. Until it climbs out of it, then fatigue will continue to mask fitness. Being so severely sore that you can barely stand or have to change your gait when walking isn’t productive. This is a sign that you’ve exceeded your body’s capabilities to repair and recovery properly. It’s basically like sustaining an injury. And what happens when you get injured? You may have to take time off from training that area, and ultimately a degree of atrophy sets in. In other words, if you get so sore you can’t train without significant pain, then you crossed the threshold of localized muscular recovery. This is bad. Most of us like being sore. Whether it’s a sign that the workout was productive can’t be factually quantified. This doesn’t take away from the fact that most people who are diehard gym rats tend to enjoy a bit of soreness. It’s blissful and reassuring in a twisted kind of way. For advanced lifters, DOMS usually sets in to some degree when new training is introduced. Sometimes this is a small change, like foot position for squats, and sometimes it’s a complete training overhaul. After a few weeks on the same training plan, DOMS tends to subside and progress can still be made, though growth is usually seen weeks later, even after DOMS has mostly subsided from a routine. Some people just don’t get very sore, or sore at all, from training. And certain body parts grow just fine while rarely getting sore. So this has to be the nail in the coffin in regard to DOMS being linked to growth, right? Well, not so fast. Areas like the delts or forearms probably don’t get sore very often because they’re used in virtually every movement we perform in the gym and they’re active in everyday life. So they tend to adapt to training stresses quickly. There is also another factor that comes into play here. Unlike say, the quads, pecs, lats, biceps, and triceps, there’s really not much of a movement that puts the delts in an extended stretch at the bottom of the eccentric (negative) portion of an exercise. Movements that really load the muscle in a lengthened position tend to also cause a significant degree of DOMS than exercises that don’t. Think stiff-legged deadlifts, chins, flyes, incline dumbbell curls – these can all stimulate a great deal of soreness. Movements that offer a great deal of tension while in a fully lengthened position also tend to offer a greater potential for growth. Biomechanical specialists share this same belief. Eccentric training performed at high intensities was shown to be more effective in promoting increases in muscle mass measured as muscle girth. In addition, eccentric training also showed a trend towards increased muscle cross-sectional area measured with magnetic resonance imaging or computerized tomography. Subgroup analyses suggest that the superiority of eccentric training to increase muscle strength and mass appears to be related to the higher loads developed during eccentric contractions. We’ve also seen a more rapid rise in muscle protein synthesis when comparing concentric-only loading to eccentric-only loading. When you start looking at the body of evidence behind eccentric based training, or emphasizing the eccentric portion of a movement, it should be clear that it offers a significantly higher degree of growth potential. The problem is, people end up using all sorts of eccentric-based movements outside of the gym to say it’s of no relevance. But it’s really comparing apples to oranges. Running down a hill isn’t quite the same as doing a balls-to-the-wall set of 10 on squats with a 5 second eccentric in regard to muscle growth. So let’s stop with the silly comparisons. So is THIS our link in regard to DOMS and hypertrophy? Eccentrics cause more DOMS. Eccentrics also tend to have a higher potential for muscle growth. There’s some correlation. The degree of its relationship is the part that can’t currently be answered. Can you do the same thing with the concentric (lifting portion of an exercise) and get the same effect? The shortcoming with the concentric being used in a slow manner is that it ultimately limits the amount of weight that can be used in the exercise. And no matter how slow and controlled you are with a movement, there comes a point where you’re going to have to actually sling some real iron around in order to grow. Controlled but EXPLOSIVE concentrics with slow and deliberate eccentrics tend to be the most efficient in regard to offering growth potential in a movement. What About Huge Dudes that Don’t Get Sore? Sure, there are those who train frequently, get pretty big, and don’t really get sore. And there are those who train less frequently and are sore quite often. The former are people who train often, adapt fast, and force their body to deal with the increased workload. The latter are people who actually detrain a bit from not training enough. People who train frequently stimulate muscle protein synthesis more often, thus setting the body up for more opportunity to grow. Despite the fact that they don’t get sore due to adapting to higher frequency, six training session a week means twice as many opportunities to stimulate muscle growth than someone only training three times a week. If the person training twice as much also regulates his volume and intensity properly so that recovery is met, then he consistently gives himself more opportunities for growth. The fact that he isn’t sore very often yet grows faster shouldn’t be surprising, nor does it eliminate the possible connection between DOMS and growth. After all, he may be adapted to a certain frequency of training. But throw in some new wrinkles to a daily session and most likely DOMS will appear again. Why? Because the body is trying to adapt to a new stimulus. One other valuable use for DOMS is to “chase” soreness via the old Vince Gironda method. How? Go into the gym, do one movement for eleventy-thousand sets, and wait around for the next two days to see where you’re the most sore. This gives you specific feedback as to what area is generating the most tension during that particular exercise. This can be used by bodybuilders or strength athletes alike. Bodybuilders could use it to figure out if a particular movement is a good choice for bringing up a lagging body part, and strength athletes could use it to determine if that exercise is targeting weak links in the muscular chain in relation to competition movements. Too much soreness is bad and can actually encourage a setback in training. DOMS has a huge genetic factor associated with it. Adaption and eccentric loading tend to cause the greatest amount of DOMS, and yet those two things also seem to be linked to more growth as well. If you never ever get sore, regardless of genetics, you’re probably training like a pansy. DOMS can be a good tool to use to determine fiber segmentation in regard to what muscular area is generating the most tension in a movement. Soreness is pleasurable for most lifters. Don’t chase soreness or use it as a barometer to judge the efficiency of a workout. But don’t rule it out as having some link in regard to muscle growth either. Don’t get so sore you need a cane, but if you never get sore then ask yourself if you’re just The Wolverine reincarnate or if you’re just training like a puss. More than likely, it’s the latter. Roig, M., et. al. “Result Filters.” National Center for Biotechnology Information. U.S. National Library of Medicine, 3 Nov. 2008. Web. 17 Feb. 2016. Moore, D. R. “Result Filters.” National Center for Biotechnology Information. U.S. National Library of Medicine, 30 Nov. 2004. eb. 17 Feb. 2016.